12th December – A day dedicated to the backbone of the retail industry, retail employees. The significance of shop floor employees among retail employees is undeniable as they are essentially the ‘face’ of the business – they hold the relationship with the customer, and the effective engagement of these employees is a fundamental part of successful workforce management. It is in this spirit that Retail Employees’ Day (RED) was started. Conceptualized by TRRAIN & celebrated in partnership with RAI (Retailers Association of India)in India, Retail Employees Day is celebrated on the 12th of December every year, encouraging employers and customers to recognise the efforts of retail associates across the country and express gratitude for their untiring support. Making employees feel valued and striving to build genuine relationships with them can help create loyalty, boost performance and nurture positive attitude. 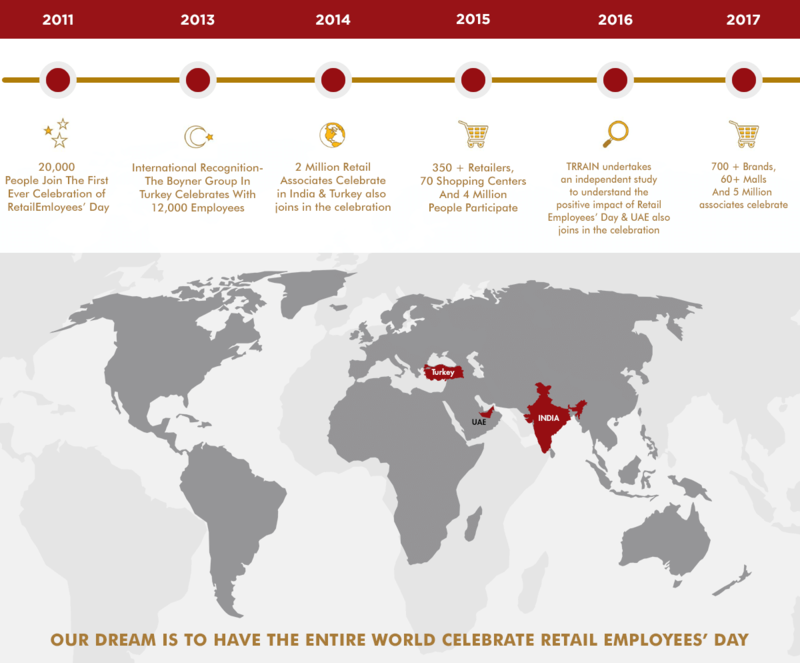 This initiative, which began as a small celebration with 20 retailers in 2011in India has now grown to over 5 million retail employees celebrating across 3 countries – India, Turkey& UAE. RED has found widespread adoption across retailers and brands of all sizes and across geographies. Planning for RED starts over 1.5 months in advance leading to buzz being created one week before the day. Most companies have a separate budget crafted to carry out activities on the day. Top management blocks their calendars every year for RED and visits stores. It has become an occasion for employees from Head offices and stores of different brands to celebrate together. Celebration with a lasting impact – Research report. In July 2016, TRRAIN undertook an independent study in order to gain a deeper understanding of the positive impact of Retail Employees’ Day on different aspects of employee performance. The study mapped different stakeholders involved in the retail ecosystem and collected data from 25 top management personnel, 25 store managers and over 200 retail employees. The results of the study have been truly encouraging, displaying a favourable impact on employee engagement and morale. The HR Heads of companies agreed that Retail Employees’ Day positively affects employee morale, impacts team work and serves as a great platform for employee engagement. Interviews with CEO’s revealed the positive impact of Retail Employees’ Day on business outcomes stemming from increased productivity, improved teamwork and positive energy created by Retail Employees’ Day activities. A single day can truly have a lingering positive impact and be instrumental in instilling long lasting pride & joy in the retail sector. With the support & encouragement from retailers, TRRAIN believes that the day is on its way to becoming an iconic industry-wide celebration in India & across the world. The Business Excellence Department (BED) in the Department of Economic Development (DED) launched a campaign in connection with Retail Employees’ Day in 2016 to encourage retail outlets to celebrate the day and share their stories using the hashtag #BEDforRED. The campaign was a part of promoting happiness and service quality in Dubai, particularly in the retail sector, in line with the strategic objective of BED. In order to ensure that maximum retailers celebrate this day, The Business Excellence Department had sent messages to nearly 2,000 retailers who are members of the Dubai Service Excellence Scheme (DSES) of DED, urging them to celebrate the day and build a culture of appreciating the efforts of their employees throughout the year to make it a global phenomenon. The individual outlets also welcomed this initiative with open arms and celebrated the day with various programmes such as red-carpet welcome, photo sessions, cake-cutting, ‘Thank You’ messages and memorabilia for their employees. In 2013, Retail Employees’ Day inspired Boyner Group in Turkey to celebrate this day with their 12000 employees resulting in the countrywide celebration in 2014. More than 2 million people from the Turkey retail industry celebrate this day every year making this simple idea of ours a truly global phenomenon. Activ Casio Fastrack Image Lite Nyciti Roxy Tiffany & Co.